This is a bonus post in the project management using excel series. 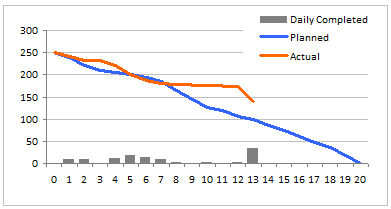 A burn down chart is graphical representation of work left to do versus time. The outstanding work (or backlog) is often on the vertical axis, with time along the horizontal. That is, it is a run chart of outstanding work. It is useful for predicting when all of the work will be completed. Just select the Balance Planned and Balance Actual series and create a line chart. Use the first column (days) in the above table for x-axis labels. Remove or set grid lines as you may want. Adjust colors and add legend if needed. There is no step 5, just go burn down some work. Click here [.zip version here] to download the excel burn down chart template. Use it in your latest project status report and tell me what your team thinks about it. Also check out the budget vs. actual charting alternatives post to get more ideas. Where would you use burn down charts? We have used burn down charts in a recent presentation to client and they loved the way it was able to tell them the story about status of Phase 1 of the project. We needed to deliver 340 items in that phase and we have finished 45 when we made the presentation. My client could easily understand where the project is heading and what is causing the delays (of course by asking questions). What do you think about burn down charts? Where will you use it? Tell me about it using comments. @Michael: Often some offices and networks block skydrive. Can you try from some other connection and let me know if you still face the problem? I think it's an interesting view and relatively simple to generate. It can give a quick view of how your run rate is progressing against plan. The same can be done with the hours expended on a project as well. Your burn down approach is most valuable if all of your deliverables are relatively equal in size/complexity. In your example chart, although you're currently behind, it looks as though you'll be catching up quickly with the recent acceleration in delivery. If the delay was caused by tackling the larger/more complex deliverables first, I'll have a lot of faith that you can catch up to plan quickly. On the other hand, if you've only completed small/simple deliverables, then I doubt you're going to get back on schedule. But that gets in to more complicated earned value analysis...and the whole point of this was to do something quick and easy. I think the payback/effort is well worth it in this case and is a good balance to the hours being charged to your project against deliverables being produced. One final comment...did you consider putting the Daily Completed bar chart on a secondary axis? Since daily volume is plotted against the total volume, it's always going to be difficult to see low volume days. One other thought. If I were your customer, I'd be asking for a revised plan based on actuals to date to understand whether you think you're going to get back on track or not. To do that, you'd need another column to plot. The original plan could be captured in a new column ("Baseline") and the planned column could be updated with the new forecast. I have considered the secondary axis thing. Then all the issues of axis scale etc. seemed like a headache. Assuming the weekly productivity is prettymuch same, then excel quickly shows very tall bars (and adjusts the max accordingly). This creates an annoying effect. But may be for a given project we can find the usual pattern and set the axis max accordingly. "Your burn down approach is most valuable if all of your deliverables are relatively equal in size/complexity. " I agree. It is better to chunk work in to meaningful portions and then make the chart. If the portions (or deliverables) are not equal, we can consider adding one more column where we can compute burn down units based on the weightage of individual items. Usually burn down charts work well for function point based estimate. The more complicated a function or deliverable is, the more function points it will have. "One other thought. If I were your customer, I’d be asking for a revised plan based on actuals to date to understand whether you think you’re going to get back on track or not. To do that, you’d need another column to plot. The original plan could be captured in a new column (”Baseline”) and the planned column could be updated with the new forecast." That said, we can easily add one more line to this chart with "original plan" values and color it differently. I am confused... I just ordered the dashboard template and the deliverables are in number of days but everything else is in number of weeks... what am I missing? @Sally.. Thanks for getting a copy of this. You can change the column title to weeks and everything should be alright. Why do you have to login to get the Excel tool? I Think he is phishing. People like him give the web a bad name! Why do you have to login to Windows Live to get the Excel tool? I was already signed in in another window and his link is still is asking for my password to Windows Live. Think he is phishing. People like him give the web a bad name! @Fred... It is a skydrive limitation. They want you to login to Windows Live before giving access to the files I have uploaded. If you dont want it, do not download. Why do you need to call me an idiot. I never asked you to share your login details with me. But, I am not entirely sure how to properly implement it based on the given example. I am also not sure if it will work given that the actual balance and the daily completed (4th and 5th) columns will return #N/A values when the planned task balance reaches zero. Why not have one online and shared for free like http://www.burndown-charts.com does ?? How do you come up with the "Planned" numbers per day? Do you have explanations for the fields and how this tool should function with the multiple worksheets. I am a novice looking for a great project management tool and not quite sure where to start. 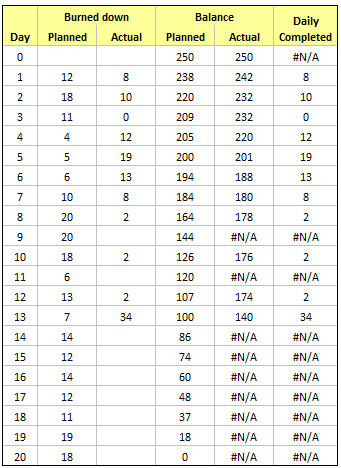 I have one query that in that table how we calculate planned and actual balance in excel with formula?